The MaKey MaKey is an invention kit that tricks your computer into thinking that almost anything is a keyboard. For example, play Mario with a Play-Doh keyboard, or piano with fruit! Using the MaKey MaKey you can make anything into a key (get it?) just by connecting a few alligator clips. The MaKey MaKey is an invention kit that tricks your computer into thinking that almost anything is a keyboard. This allows you to hook up all kinds of fun things as an input. For example, play Mario with a Play-Doh keyboard, or piano with fruit! The MaKey MaKey uses high resistance switching to detect when you've made a connection even through materials that aren't very conductive (like leaves, pasta or people). This technique attracts noise on the input, so a moving window averager is used to lowpass the noise. The on-board ATMega32u4 communicates with your computer using the Human Interface Device (HID) protocol which means that it can act like a keyboard or mouse. There are six inputs on the front of the board, which can be attached to via alligator clipping, soldering to the pads, or any other method you can think of. There are another 12 inputs on the back, 6 for keyboard keys, and 6 for mouse motion, which you can access with jumpers via the female headers. If you wish to use a different set of keys, or otherwise change the behavior of your MaKey MaKey, you can simply reprogram it using the Arduino environment. Oh yeah, we didn't mention that the MaKey MaKey is an Arduino-compatible controller? That's right, it runs the Leonardo bootloader so reprogramming is fast and easy. 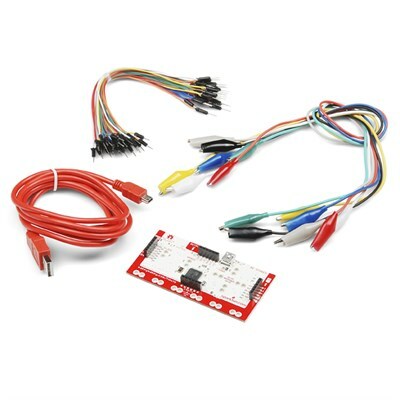 Note: Now included with the MaKey MaKey is a USB cable, pack of jumper wires as well as a pack of alligator clips!